Landmarks rise sharply from the steppe within the boundaries of Utah's most visited park, Zion National Park. Extraordinary columns of vertical rock, formed millions of years ago, provide today's brilliant display of sandstone. Early pioneers gave biblical names to many of Zion's great monoliths. 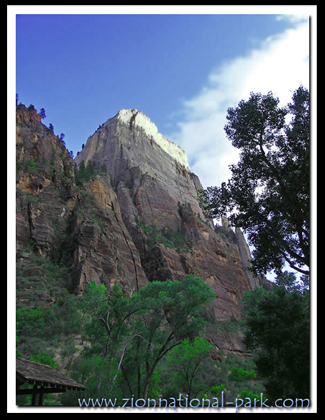 The names Angels Landing, Great White Throne, Three Patriarchs, Cathedral Mountain, West Temple, East Temple, Altar of Sacrifice and the Temple of Sinawava are all reminders of Zion's early beginnings. 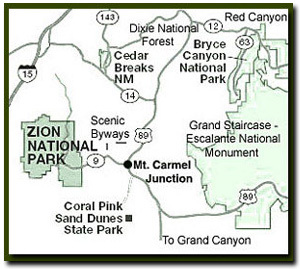 In 1918 the existing name of Mukuntuweap National Monument was changed to Zion National Monument. A year later the Monument was proclaimed a National Park. Angels Landing - Who could have ever conceived of such a trail as this, it is like an island in the sky often surrounded by low lying clouds. The actual path is a half-mile of narrow rock protruding out of Cathedral Mountain. Angels Landing is a rival for the best known landmark in Zion National Park, the Great White Throne. Climbers scale the big wall, hikers walk the steep path leading to the narrow and arduous fin and sightseers stand in awe at its stunning nobility .A group of four men, F. Fisher, V Fischer, E. Bingham and C. Hirshi were exploring Zion in 1916 when upon looking up at the great monolith, Frederick Fisher exclaimed, "only an angel could land on it," and the name Angels Landing stuck. Another name considered for Angels Landing was "El Gobernador," a Spanish term to honor William Spry. Later, Spry Canyon, a technical slot canyon, was named in his honor instead. Elevation: 5785 feet. Great White Throne - The Great White Throne is an impressive monolith rising more than 2400 feet above the canyon floor. The Zion Canyon Shuttle stops at a viewpoint for the Great White Throne and the nearby Organ. There are no trails to the top of it, but the magnificent white topped monolith is perhaps the most famous of all Zion's landmarks. Even historic brochures often used a photo of it as the cover. W. H. W. Evans was the first to climb the Great White Throne. The attempt was made on June 27, 1927, but he fell on the climb down. Hidden Canyon was discovered during the rescue and as a result the East Rim Trail leading to Hidden Canyon was built. The name, Great White Throne, was given by the same Methodist minister, Frederick Fisher, that also named Angels Landing and the Three Patriarchs. Fisher felt that the monolith was magnificent enough to symbolize the throne of God. Elevation: 6744 feet. 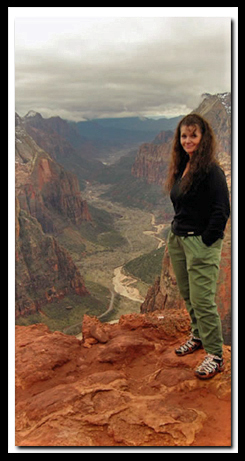 Zion Photo: Author of the site, Tanya Milligan on Observation Point, where many of Zion's most famous landmarks can be seen including Angels Landing, Cathedral Mountain, Castle Dome, Three Patriarchs, Cable Mountain, Great White Throne, and the Watchman. Cathedral Mountain - The Zion Canyon Shuttle ride through Zion Canyon reveals some of Zion's best known landmarks such as Cathedral Mountain, located immediately west of Angels Landing. In 1931, a successful climb up Cathedral Mountain was recorded by another climber. Cathedral Mountain was named by Stephen Johnson in 1922. Elevation: 6900 feet. West Temple - The Spry Canyon route leads to a wonderful view of the West Temple and the "horse head" on its face. The horse head is seen when driving along the south side of the Zion-Mt. Carmel Tunnel, going toward the tunnel. The towering West Temple is peeking high throughout most of the park as well as from many viewpoints outside of Zion. In 1933 the West Temple was climbed for the first time. John Wesley Powell named the West Temple. Elevation: 7810 feet. East Temple - The East Temple is a huge mesa towering 2000 feet from the road. This enormous mountain is seen from many different perspectives around the park. Perhaps the best view is from the east side of the park along the spiraling Zion-Mt. Carmel Highway. The East Temple was named by John Wesley Powell. Elevation: 7110 feet. Checkerboard Mesa - Checkerboard Mesa is a mass of slickrock with crossbedding etched into the north face of the rock. The imperfect vertical and horizontal fissures are a result of jointing and crossbedding. The checkerboard design has been created by weathering and erosion in the upper portion of the Navajo Formation. Checkerboard Mesa was named by one of Zion's superintendents, Preston Patraw about 1938. Prior to that time it was known as Rock Candy Mountain. Elevation: 6670 feet. Three Patriarchs - One of the first shuttle stops is at a short, uphill path leading to a viewpoint to view a trio of similar shaped cliffs. The Three Patriarchs are named: Abraham, Isaac, and Jacob. From the view point many Zion National Park landmarks are seen including Mount Moroni, the Spearhead, Mountain of the Sun and the Twin Brothers. Reverend Fisher along with naming the Great White Throne and Angels Landing, named the Three Patriarchs: Abraham (6990 feet), Isaac (6825 feet) and Jacob (6831 feet).